Taking the least-squares linear-regression trend on this dataset (the bright blue horizontal line through the dark blue data), there has now been no global warming – at all – for 17 years 5 months. For all the RSS watchers out there, here is an animation of the monthly RSS chart starting with the same period that Christopher used and stepping back 12 months at a time to when the satellite record began. Note the heading should read RSS Lower Troposphere Temperature. (It took too long to prepare so I'll not bother changing it just to fix the chart title). 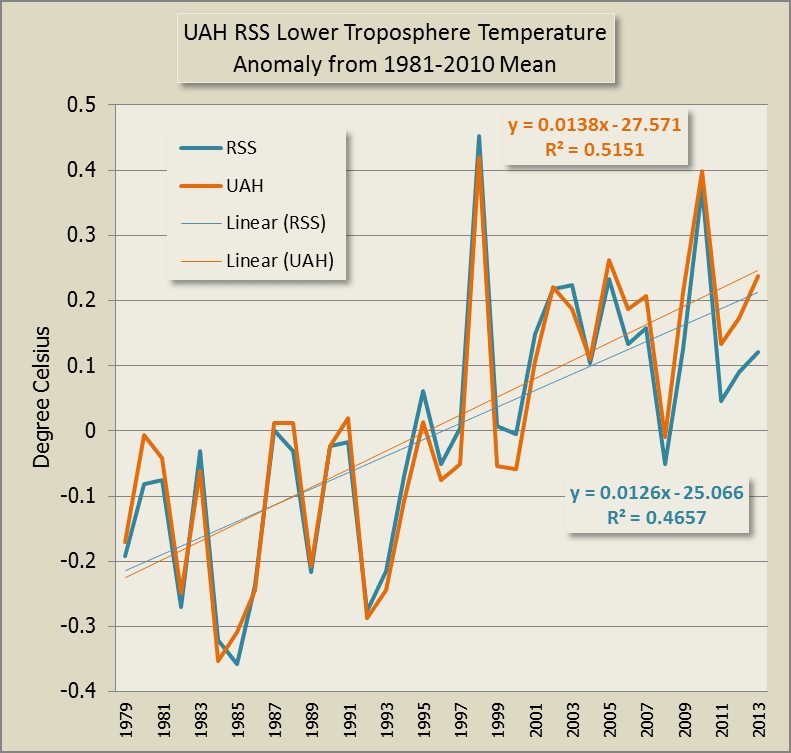 And here is a comparison of RSS and UAH annual temperature anomalies from the 1981-2010 baseline - over the full period of lower troposphere temperatures. You might be interested to know that from 1998 to 2013 (inclusive), with both UAH and RSS there were seven years where the annual temperatures were below their respective rising trend lines and nine years where the annual temperature was above the rising trend lines. I'm not trying to make any particular point here. Just figured you'd like to see what is occupying the collective mind of the denialati at WUWT. Just the same, for anyone who thinks that the rise in global temperatures has stalled, I suggest you read this article by Tamino and check out the updated Cowtan and Way analysis. Here is a sample of comments, mostly from the WUWT illiterati (archived here). When one’s group is shown deficient because the facts do not support them the only recourse left is to deny a voice to those exposing the lie. The Liberal Main Stream Media following the emperor and his new cloths blindly. Is Latitude saying he doesn't believe Christopher? 17 years 5 months of lying……..
A gamble at which we will modulate the pleasure of being proven wrong. Times they are a-changing, and perhaps a bit quicker with the British media. I will predict 2 independent publishers, within 10 days, one in England, and another – notable – elsewhere. And on top of this, they have levered the pre-satellite record downwards to get rid of the pesky 1930s/early 40s record temps, believing, apparently correctly, that the big El Nino of 1998 may be the last chance to get a new world record for some time. I have to admit that I’m frustrated the temp isn’t declining a little bit in retribution for all the augmentations to warming that were done in the 1990s. How much discretion is there in “validating” the satellite record. If there is any, it will be to jack up the right end of graph. Is that the same as saying the warmest 17 years on record have occurred in the last 17 years? I’m detecting that folk feel I’m supporting the warmist agenda.. I’m not, my use of words was an attempt to convey the stupidity of the line Yeo took with Lindzen. I should have clarified my meaning. It IS how they will portray it….. The spike in Earth’s computed mean temperature from approximately 03/31/97 to 03/31/98 is 1C. This is 30% greater than any other spike I can find in the satellite or land based temperature records going back to 1880. I don’t believe the El Nin~a in ’98 was strong enough to account for this anomalous spike. And NASA/NOAA TOD adjustment had not been injected into the US land base records. Where did all this extra energy come from? I think the Earth received a glancing blow from a gamma ray burst. Any other plausible sources, explanations? Visiting Physicist is correct. He and I have clearly been working independently in the same area. Moreover, the effect of CO2 is such as to have a de facto climate sensitivity of <0.1 K. This is because it is a minor part of the radiative heat transport that pushes lapse rate to the moist level. Also, the Earth's surface emits zero net IR energy in all the self-absorbed IR bands, including CO2 and H2O. I know, Sir Christopher, that you are a self-confessed “scientific non-scientist” ,that RSS is your preferred data set and you’ve constructed a graph that points down. But I’m a simple bloke. I look at the “simple running 37 month average” on the 5 data sets on climate4you ( http://www.climate4you.com/ ) and what do I see? UAH peaked in 2010, RSS in 2003, HadCRUT4 in 2006, NCDC 2006, and GISS in 2006. The “superimposed plot of all five global monthly temperature estimates” comes out at 2006. Nice animation. But can you clarify your "heading should read RSS Lower Troposphere Temperature". Monckton,s chart is labelled "Anomalies_Land_and_Ocean". What you are reading is the link to the RSS data. The TLT in the link indicates it's lower troposphere temperature. The data is monthly temperature anomalies of the lower troposphere as reported by RSS, which is the average from 82.5N to 70S, so not quite the entire globe but does cover the lower troposphere over both land and oceans. If you click on the link I provided it shows the text file with the data that indicates the latitude bands. I should have given you this link, although it's fairly technical. There are some graphics that help describe what is being measured and how. What is interesting is how the analysis is conducted to put together the TLT estimated temperatures. It's not at all straightforward and includes multiple instruments and multiple satellites and splicing of records. The way some deniers latch onto RSS data as if they are direct readings of temperature from a single instrument on a single satellite (they aren't), and the way they say they prefer RSS to thermometers on the ground, indicates most of them have no idea of how the scientists work out the temperatures of the lower troposphere (or other parts of the atmosphere). Sou, an interesting aspect of RSS is that it really cuts off most of the Arctic and Antarctic, unlike UAH. I'm not sure how related it is, but Cowtan and Way showing how much taking the Arctic into account means for the trend of HADCRUT4 I would not be surprised that RSS is so 'flat' at least in part due to that aspect. Marco, from the data, RSS cuts off a little bit of the Arctic but not most of it. It goes up to 82.5N. RSS does cut out most of the region south of the Antarctic Circle, only going as far as 70S. I think it was BBD who suggested that's because it has trouble getting accurate readings over Antartica for a couple of reasons - I think it's that the albedo interferes with the satellite readings, as does the altitude of the mountains in Antarctica. Thanks for the explanations. I was struggling with the TLAs and finding some description of the data. I have not looked at satellite data much (at all) before. I have noticed that deniers seem to like satellite data but I did not know why. I think it is because it offers more scope for obfuscation and sounding sciencey when you do not know what you are talking about. Since you posted this there is another article from WUWT promoting a misinformation video about a White House graph. One of their misinformation points was mocking the use of "middle troposphere" data. I will try and see if I can find an explanation of that somewhere. Deniers are neither consistent nor rational. 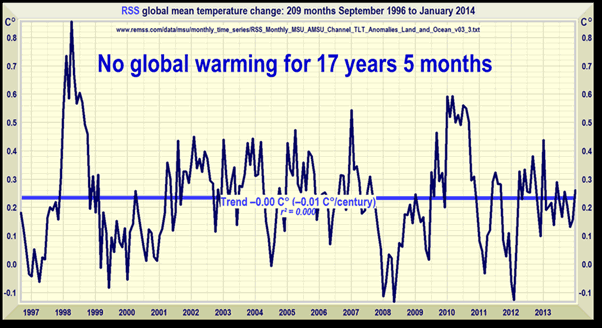 They tend to "like" whatever data they think shows least warming. This changes over time. In the past they've been bigger fans of UAH and HadCRUT than RSS. They'll even try to use HadCET (which is a conglomerate of temperatures of central England). For the moment it's RSS. That will only last until RSS has another spike, then they might shift their allegiance to GISTemp (or go back to trying to persuade people that central England is the entire world). Re: "data showing least warming" The use of satellite data (a) makes the anomalies smaller because UAH and RSS have 'warmer' baselines than other data sets and (b) exaggerates the peak data for 1998 relative to the other data sets. "(The chart that popped up as part of a background visual when John Holdren was talking was UAH as far as I can tell.)" I think they are insisting it originally emanates from the White House. If that is so it would be nice to see the original and see if the "tilt" is just an artifact of the presentation. While its nice to see Monckton using modern mathematics (rather than just using two datapoints) it seems that the El Nino cherrypick is still a fixation. I expect that he will continue to be a fan of (ab)using El Ninos when assessing temperature trends all the way until there is another strong El Nino at what - for him - would be the wrong end of the graph. He's not really a "Lord," you know. Don, Christopher's a Viscount so is a Lord (if you go for that sort of thing). He's not a member of the House of Lords (Upper House of Parliament). Your analysis confirms the point Monckton was trying to make. The trend of RSS from all start points between 1979 and 1996 up until present was positive. From that point on, it has been mostly flat or negative - 17 years of each. Why? Oh dear. Trying to explain the logical fallacy of the cherry pick to deniers is an exercise in futility. Maybe a better term for you guys should be devoiders, since your brains are devoid of any rational thought and critical thinking!! How many times must we plough this ground? There's an excellent post by Tamino on cherry picking which raises the point that when you have multiple you end up with the look elsewhere effect. It's worth reading and digesting. Basically the more samples you look at, last 10 yrs, last 10yrs 1 month, last 10 years 2 months etc, etc, the more likely you'll find one sample that appears to be significant, even though as a whole the trend is not. "....when you have multiple samples to pick from..."